Taking the maximum rightning moment of the boat as starting point of the mast calculations makes the most sense to me. Times 3 as safety factor. Eric Sponberg does the same. I picked the strength of spruce from Ian Nicholson's Boat Data Book. 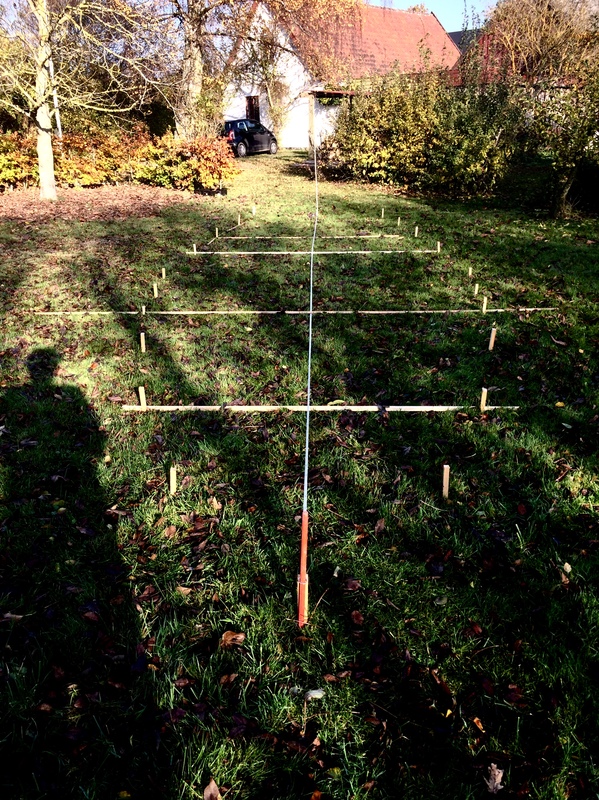 As early as in 2006, I had a go on finding the strength of wooden masts. I have later 'refined' the way to guess the righting moment of the boat, but apart from that, the write-up still makes some sense, hopefully. The uncertain factor is the strength of the wood material. We have thought about the schooner rig for quite some time. In the end I went with the yawl version hoping/thinking better performance and cheaper to build. Hi Annie. I haven't decided yet whether to go ahead with the build or not. There are a couple of things that need to fall in place. I want to be able to finish in four years and my budget would be around 35 k euros.. So before I jump in I want to be sure that it can be done within my limits. So far she's staked out in the garden.. 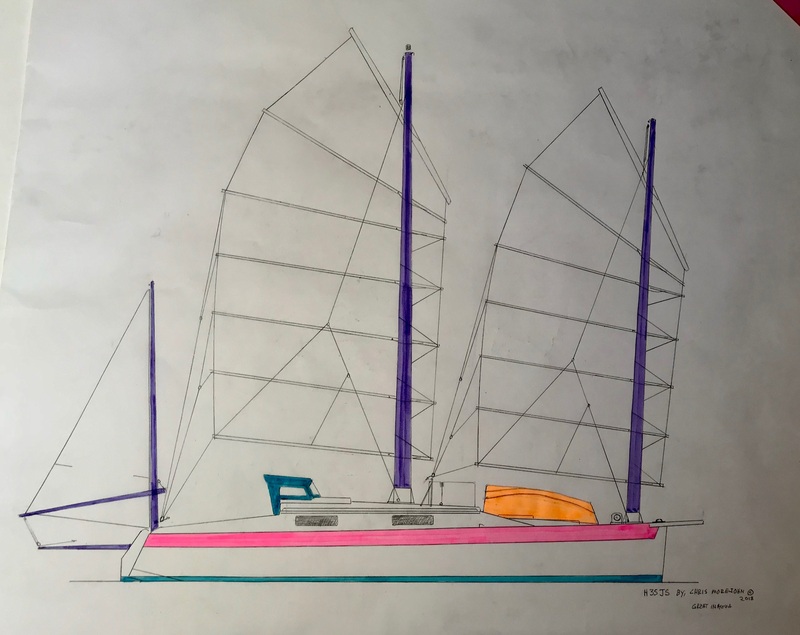 Here's another sketch from Chris Morejohn of a 34ft boat with a junk schooner rig. This puts the foremast into the space ahead of the double berth, rather than through it. With a schooner rig, similar to the 34ft Benford dories, it gets much easier to find or make masts. What's the thinking behind putting most of the sail area into one large sail, Frederik? I found 54sq m a bit much to handle, which is why I went back to a ketch rig. It's great to see another new boat about to be built! I shall be following this with interest, Frederik. I dare say your progress will be more rapid than mine! Another possibility might be making a hybrid mast consisting of a 8 meter alu 6082t6 pole, 240/10 mm with a wooden 6 meter topmast (1m bury). Appr. 200 kg..
Yeps I am happy with the design. Going back and forth the last couple of months has been very interesting. The brief was; ocean going, shallow draft, junk rig, outboard engine, two persons. Now I'm doing the rounds and finding out about materials, prices etc... we'll see..
Tystie's 220mm dia x 5mm wall mainmast actually had a doubler inside, 3m of the same section as the mast, with a sliver cut out of it so that it could be squeezed in and persuaded inside the mast. Because of the longitudinal cut, it may have doubled the wall thickness but I don't think it doubled the strength of the mast, though it must have added something. The original LAP was 10.5m, for a low AR rig, so somewhat shorter than this proposed design. When I lengthened it for a high AR rig, it was with a 10in dia x 0.25in wall tube. I am excited to see you are considering building a Chris Morejohn HF design with a junk rig. I absolutely love the lines on all his drawings. I had a few email exchanges with Chris but eventually it became clear that boat building was not the way for me to go right now. I share your opinion. If I ever build a boat the HF designs will be right at the top of the list. I would very much like to see the HFJY34 drawings from your post brought to life and sailing.